A medical claim form is essentially a document which contains medical billing of a patient, and it is forwarded to the insurance carrier which is responsible for providing healthcare coverage to the patient. 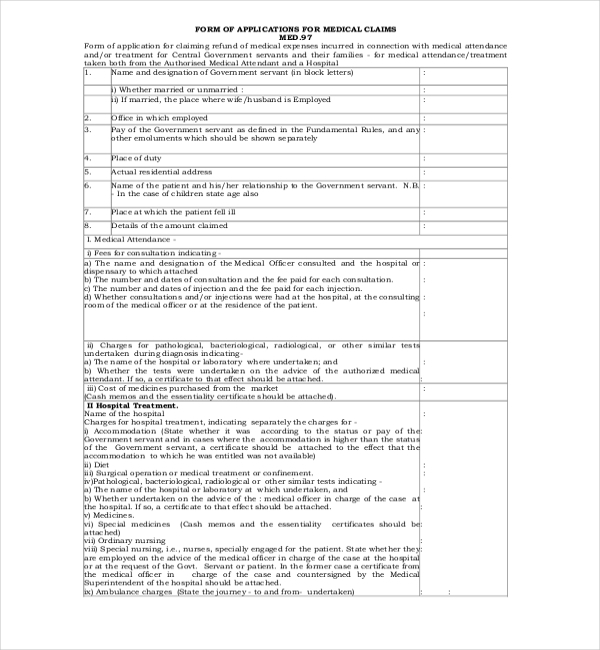 The form is an elaborate set of items, which need to be filled by the patient, family member or a healthcare professional in charge of administering care to the patient. 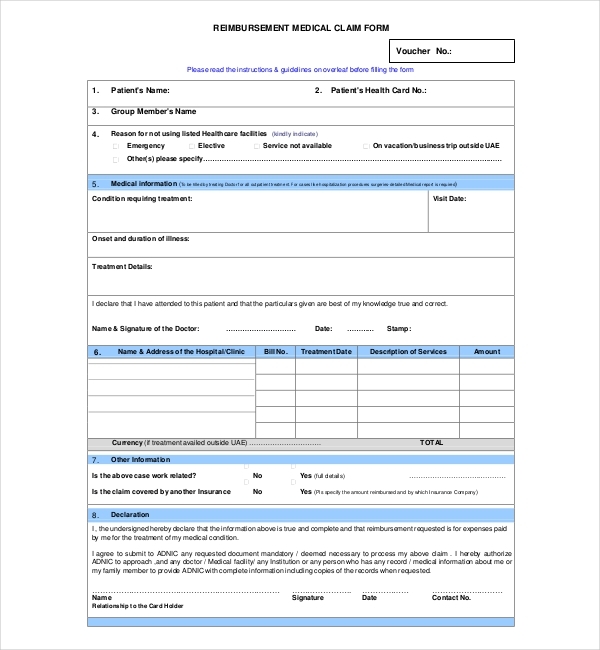 A medical form would usually contain sections: Primary Customer Information, Patient Information, Claim information, and Family/other Coverage information. 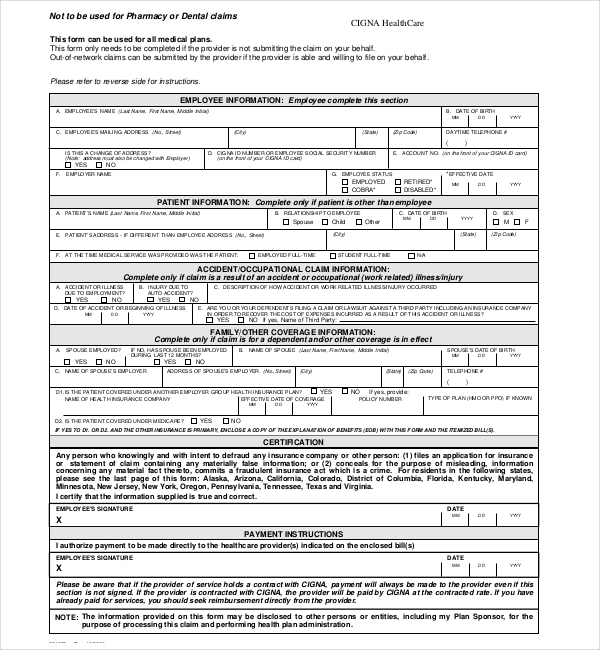 You may also see Medical Release Forms. 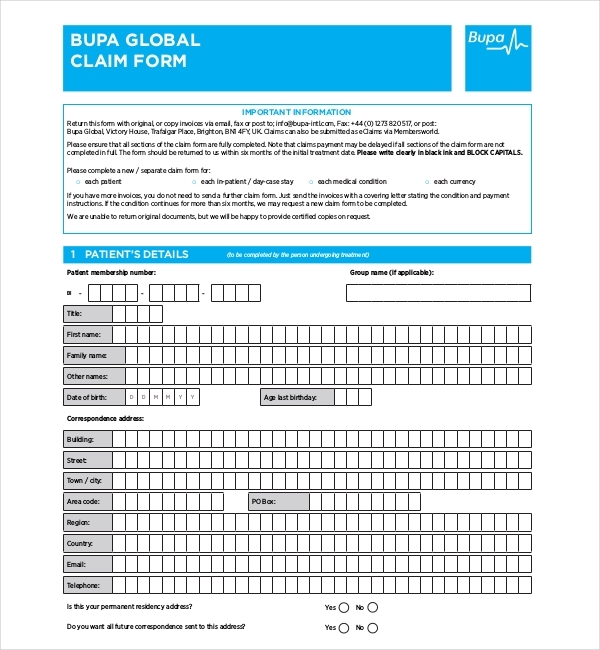 The Bupa medical claim form is a 4-pager. All of the sections have been divided in separate blocks – Patient Information, Medical Details, Cash Benefit, Payment Details, Consent To Obtain Report, Third Party Insurers, and Declaration. This form sample has very neat and organized layout, and interesting color combination of light blue and white. 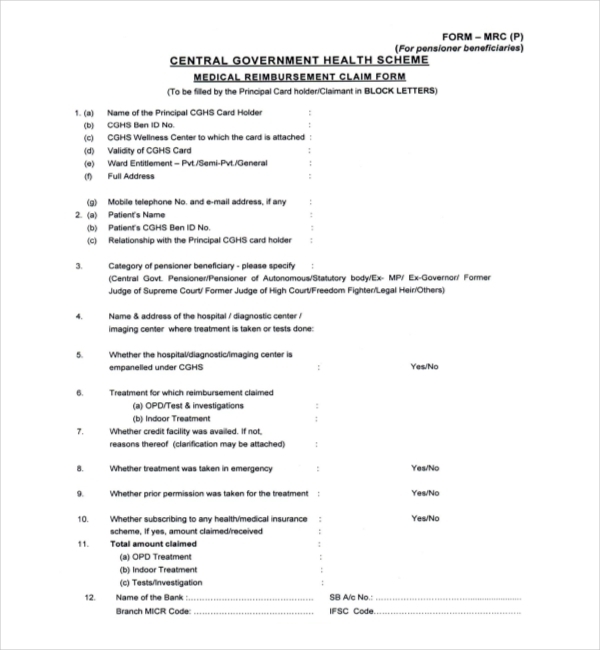 A sample Medical Claim form for Central Government Employee is designed to specifically for government employees that want to reimburse their medical expense from a governmental source for themselves or next of kin. The particulars fields in any sample form of such kind would include sections seeking full details of the employee, illness information, hospital consultation and treatment specifics, charges and fees incurred, and declaration statement followed by the signature of the government servant. 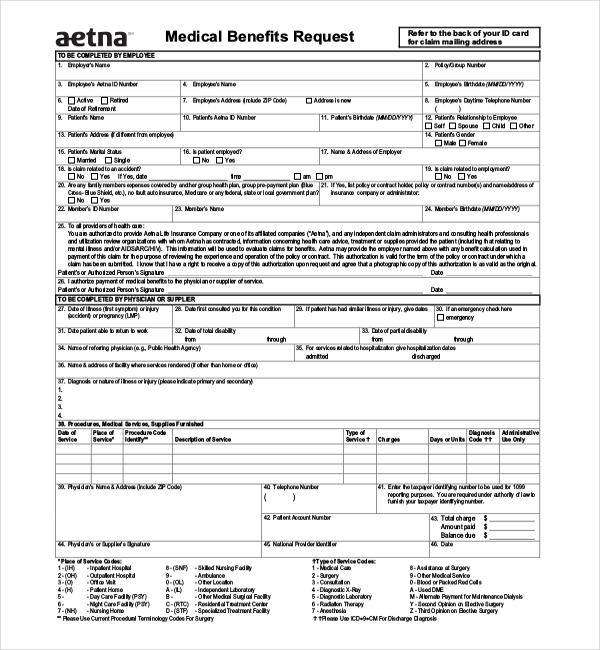 This Aetna medical claim form is yet another sample which you use as a format for a medical form. This one’s called the Medical Benefit forms, There are total of 44 items which need to be filled with the relevant particulars and options. The first half of the form needs to be filled by the applicant employee, and the latter half needs to be filled by the physician authority. 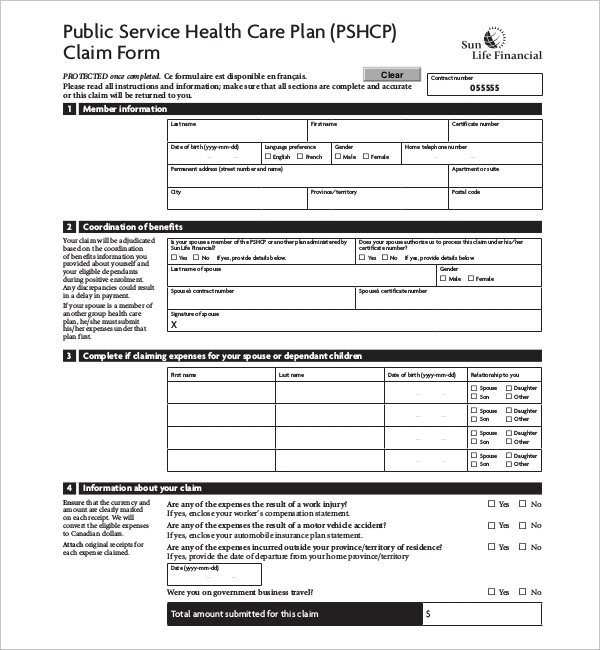 In this particular sample of the Blue cross medical claim form, you will notice the form is quite concise – the customer and patient information items have been clubbed together in one section, whereas Physician and Provider Information fields have been combined in the latter half of the medical form. This one is yet another example which could be used to create a medical form of your own. A sample of Cigna medical claim form shows the comprehensiveness that a medical claim form should have. Looking at this sample form, you’d get an idea about what fields and items should be included in a medical form. The Cigna medical claim form is divided into four separate sections focusing on different areas – they are: Primary Customer Information, Patient Information, Claim information, and Family/other Coverage information. 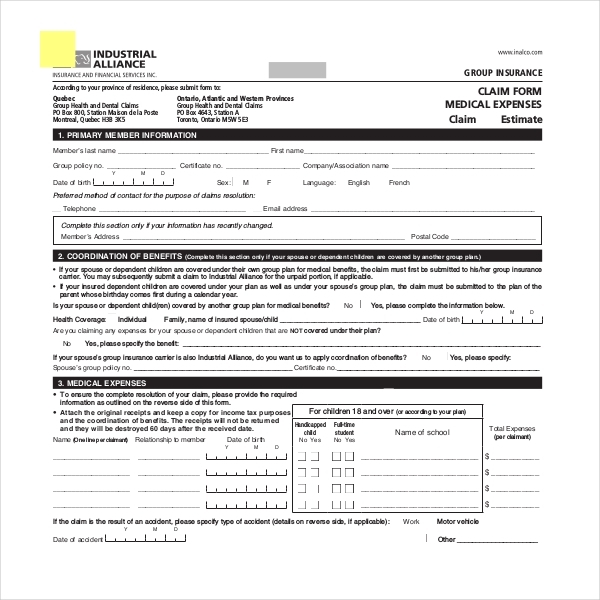 This is the sample Industrial alliance medical claim form, which is an insurance company by itself. 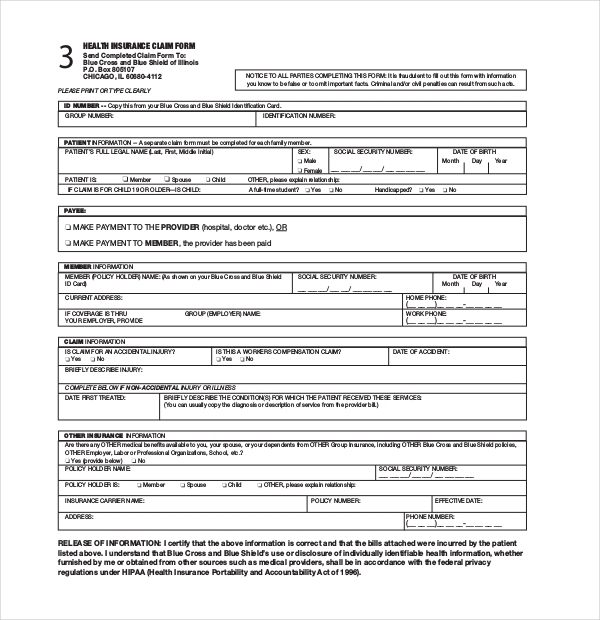 The sample form as you can is divided into four pivotal sections including Primary Member Information, Coordination of Benefits, Medical Expenses, and Member Confirmation Authorization. All of this is followed by the guidelines and claim requirements laid down by the company. This yet another sample form to show you the variety of formats and texts which exist in medical claim form. 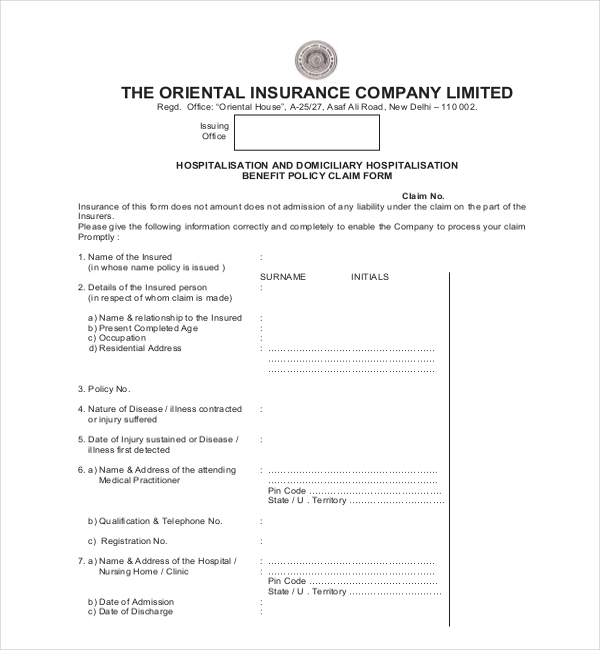 This is a sample of Oriental insurance medical claim form. The form has a mix of tables and blocks which have been provided to specify the information asked. The form is called Hospitalisation & Domiciliary Hospitalisation Benefit Claim Form. The form features fields seek insurance policy cover details, nature and date of injury and other such details. The format of a Pensioner medical claim form is slightly more specialized than the others. While the lineup of the necessary fields and items is more or less the same as another medical form, the only difference is that there’s annexure which is included. This annexure needs to be populated in case the beneficiary of the claim is deceased in the duration of the medical treatment.